(Nanowerk News) Chemical compounds that can efficiently capture and convert light energy are in high demand as key components of inexpensive solar cells and advanced optical sensors. Carbon-based organic dyes are particularly strong candidates for such applications due to their low cost compared with the conventionally used silicon, but the lackluster performance of organic dyes has so far hindered their uptake by industry. Shuichi Enomoto, Shinichiro Kamino and colleagues at the RIKEN Center for Life Science Technologies have now discovered an organic dye that overcomes one of the major hurdles of this promising technology ("A red-emissive aminobenzopyrano-xanthene dye: elucidation of fluorescence emission mechanisms in solution and in the aggregate state"). 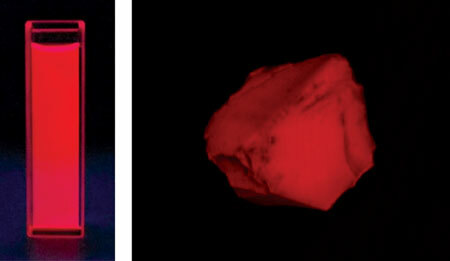 The ABPX dye produces fluorescence in both solution (left) and aggregate state (right). A wide range of organic dyes are known to exist and their performance is limited by a tendency for the molecules to form aggregates that dissipate absorbed light energy. When an organic dye molecule absorbs a photon of light, it receives a kick of energy that can be put to use either by channeling the energy into an electric current in a solar cell, or re-emitting the light to indicate the presence of a target molecule, as part of an optical sensor. The aggregation of neighboring dye molecules dissipates some of the captured energy before it can be used—a process known as aggregation-induced quenching. Enomoto’s team discovered a compound known as an aminobenzopyrano-xanthene (ABPX) dye that is not affected by aggregation. “We fortuitously discovered the ABPX dye in the process of synthesizing rhodamine B, another organic fluorescence dye,” says Kamino. Investigating the compound’s structure and photophysical properties in solution revealed that aggregate formation did not impede its energy-emitting performance (Fig. 1). The researchers found that the key to the ABPX dye’s improved performance despite aggregation is its extra bulk. The compound’s carbon skeleton is almost twice as large as that of rhodamine B and incorporates side groups that prevent neighboring molecules in aqueous solution from stacking together too closely, something that causes molecules to rapidly dissipate their captured energy in other dyes. An additional unique property of the dye is that it is readily converted into a singly charged ‘monocation’ or doubly charged ‘dication’ in response to its environment. Each ion emits light at a different wavelength, which the researchers believe can be exploited to make optical sensors. “We have developed optical sensors for detecting target metal ions by taking advantage of this property,” says Kamino. The team are already working on new iterations of the dye that retain the useful aggregation properties while demonstrating improved light capture properties. “We are currently working on energy-conversion materials for organic solar cells,” Kamino says.